Successfully Added Universal Laptop Battery Charger to your Shopping Cart. Universal Laptop Battery Charger for hours of extra laptop, notebook, or netbook power! use it to replace or charge your existing battery - this baby does both! Also perfect to breathe new life into older laptops where the original battery has died and they don't make the replacements anymore. How does it work? When your laptop is out of power, this innovative device steps in to give you several more hours of computer time. Perfect for long plane rides or simply when you've got work to do and your existing battery isn't enough! Simply attach this device to your laptop, notebook, or netbook via your computer's power adapter socket and you've got access to lots of additional power for finishing your work, surfing the net, sending and receiving email, playing video games, and much more. Best of all, you can use it to replace or charge your existing battery - this baby does both! Productivity Partner Compact, yet durable, this high-capacity universal external laptop battery charger comes with 8 different sized attachments to support famous laptop brand names such as: Sony, IBM, Dell, Toshiba, Fujitsu, HP, Acer, Compaq, Sharp, Samsung, Panasonic, Gateway, NEC, Sager, Twinhead, AMS Tech, AST, Micron, Hyundai, Trigem, and CIMV. 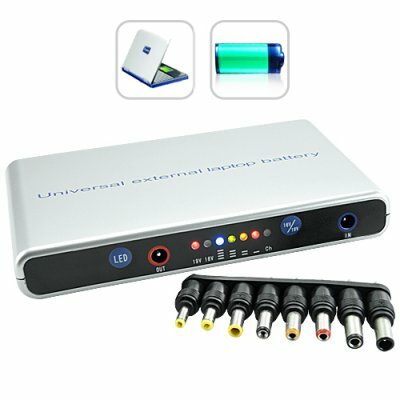 The Universal Laptop Battery Charger is especially useful for those times when you have an older laptop, the original battery has died and a replacement can't be found. Click "Add to Cart" now to try out this amazing laptop device and we'll express ship you a sample the very next day. From the leader in direct from China wholesale electronics - Chinavasion. Has built-in voltage selection button and LED indicator that displays the current voltage setting and charge status. Portable and durable, fits into your laptop bag or briefcase in order to provide much needed additional power for work or play, anytime, anyday! Great to breath new life into older laptops where the original battery doesn't work anymore! About 1-2 hours depending on your computer’s power consumption. What are some popular laptop brands this charger will work with? Can I use my own adapter tips with the G212? We definitely do not recommended it. However, if the tips fit into the G212 then it should work just fine.